In addition to the world's largest number of Indonesian bird species, at this theme park, you can also see the magnificent Komodo Dragon. A great variety of birds live here naturally, surrounded by Balinese vegetation. The park features many birds that are not kept in cages, and birds that are newly born, making it a highly popular spot where many people have said, "I enjoyed it even more than I had imagined!" The park features a two-hectare tropical park with rich vegetation, where 1,000 birds are raised—the absolutely perfect place for a leisurely stroll! We recommend seeing some unusual birds, enjoying a bird show, or watching a short film at the 4D Theater. 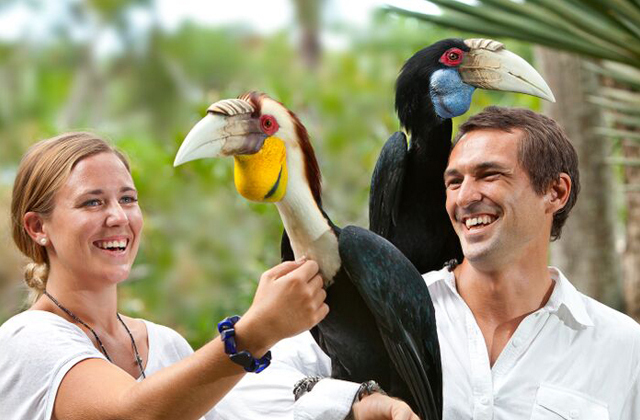 Take part in a photo session with some colorful parrots or parakeets, or sign up for an experience to feed the pelicans—plenty of opportunities for taking beautiful souvenir photos to be kept forever!